According to the “Rebuild Alabama Infrastructure Plan” unveiled by Gov. Kay Ivey (R) on Feb. 27, the state’s fuel tax would increase 10 cents per gallon over the next three years and be indexed to inflation. She noted that Alabama currently imposes a flat excise tax of 18 cents-per-gallon on gas and 19 cents-per-gallon on diesel, without adjusting for inflation and other construction and maintenance costs. 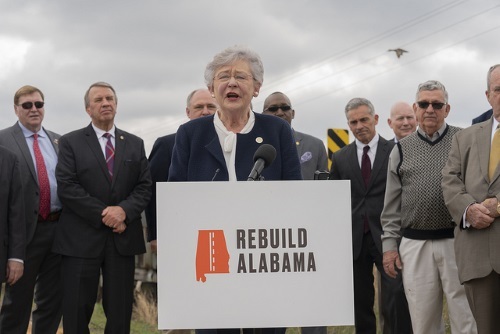 The governor said in a statement that the funds generated by that fuel tax increase will be dispersed between state, county, and municipal governments in Alabama for transportation infrastructure improvement, preservation, and maintenance projects. She added that a separate portion of that additional fuel tax revenue will go to pay a bond to be issued to finance improvements to the ship channel providing access to the facilities of the Alabama State Docks. “My Rebuild Alabama Infrastructure Plan is a comprehensive approach to a glaring issue affecting citizens in every corner of the state,” Gov. Ivey said. She also referenced a report by the University of Alabama’s Alabama Transportation Institute and Alabama Transportation Policy Research Center that found cars and trucks are putting approximately 69 billion miles on Alabama’s roadways annually; a 17 percent increase over the past 15 years. “With more travelers on the road, areas of congestion and public safety are a major concern,” Gov. Ivey said. The Alabama Governor’s Office noted that state funds currently provide 40 percent of Alabama’s total transportation funding, while the rest comes from the federal government. However, increasing uncertainty about federal infrastructure funding has created a sense of urgency for states to have reliable funding sources, Gov. Ivey’s office said, which is one reason why 37 states have increased revenue in some way for their transportation budget over the last five years.